AFCA Forums > Antique Fan Collectors Association > Pre-1950 (Antique) > What the heck did I just buy? So, I saw a listing the other day on everyone's favorite auction site for a set of four old junker fans - all 8". This particular fan caught my attention, so I shot the seller an offer. To my surprise they accepted. The oval shaped brass badge has no model or style number. It has the motor housing of a Staghorn, except with lugs for mounting the cage. 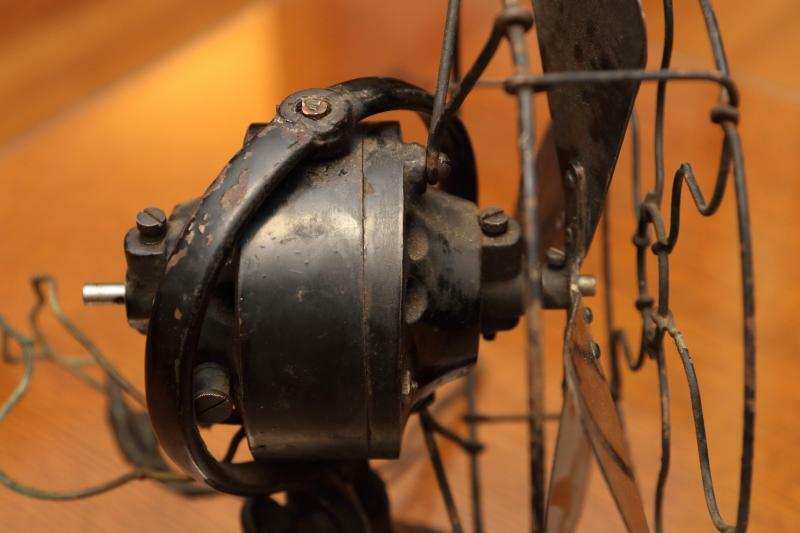 It has a steel blade and cage like the Clamshell (and the cage attaches the same as the Clamshell). Unfortunately, the oscillator gearbox and linkage are missing. If anyone has an old Staghorn that has been (or could be) parted out, please let me know. I'd like to fix this thing up. The top pivot bolt has also been creatively re engineered. I did a quick test of the motor. No joy there. At least not yet. Okay, Menominee experts. What is it? Is it a 155? It certainly looks like the top picture save for the oblong tag. What model is that? 1917 8" oscillator lost its brass. Darrell Koller wrote: It certainly looks like the top picture save for the oblong tag. What model is that style="background-color: rgb(248, 248, 248);"? Model 155. 1918 model 155 had the same construction WITH MENTION OF THE OSCILLATOR CHANGED FROM DIE CAST TO CAST IRON. I think I read that right in past. This may explain your missing gearbox as it may of been die cast or pot metal. It that a stationary motor put in an oscillator frame? No/Yes. It is a stationary motor modified to accept a gearbox. The armature shaft is extended in back for the worm gear. Notice the divot in the shaft for the worm gear set screw. The gearbox in the images is correct for Darrel's fan. You might find this interesting. It's a type 129 8" oscillator. Brass blade and cage, brush motor and identical gearbox to the staghorn. The Menominee 8" oscillators 155(SB/SC) and 129 (BB/BC) were both offered 1917-19. After carefully reading 18-19 electrical trade I came to this conclusion. In 1919 these models went to die cast (pot metal) motor housing and gearbox. 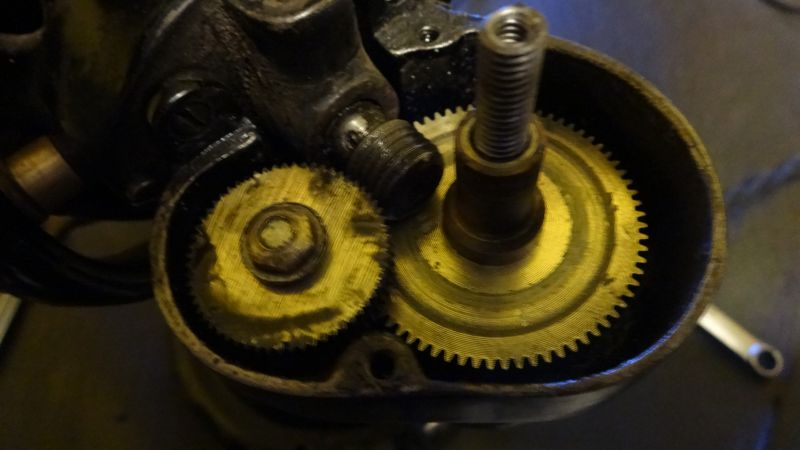 The gearbox gears were enlarged and improved using a clutch to prevent gear damage in the event the fan in oscillating mode would be obstructed. Menominee introduced DISHED brass wings in ………….19. Took some time to get to you on your question. Got sidetracked. Is it magnetic? Gearbox and motor non-magnetic, base is. Is that what you wanted to know? Bruce Allen's 32 VDC model 129 posted in past dates 1919 as both the gearbox & motor housing are die cast alloy. The MENOMINEE banner on the guard is not correct for the fan. Bruce's fan would have the new improved oscillator mechanism with clutch introduced in 19. You are awesome! Thanks for taking time to research this fan for me! So... there is another Menominee for sale on eBay right now. click here: Menominee 155. (Note that the seller has employed an overt tactic to make this item more enticing by decorating it with a loogie in the last image ). On this fan's tag it indicates Type: 155. It is obviously die cast or pot metal - very different from my fan. Sadly, the gearbox is busted on this one too. 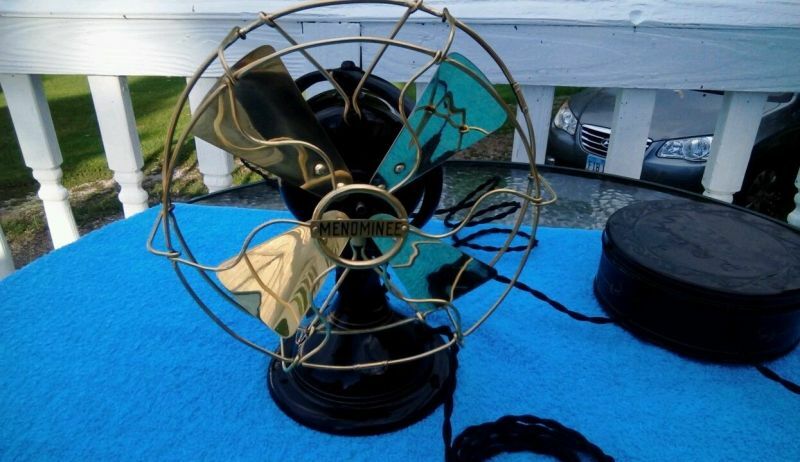 Did Menominee reuse model/type numbers for completely differently constructed fans over different model years? 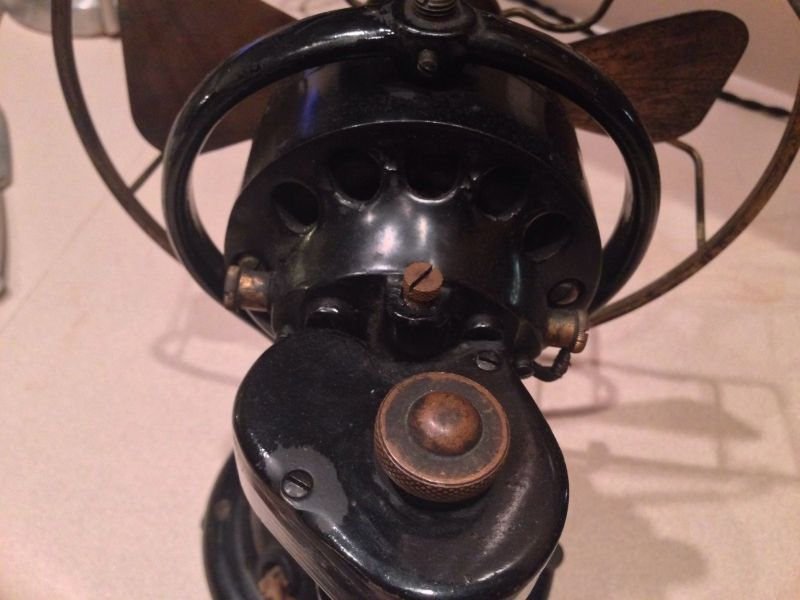 Would my fan, which is all steel/cast-iron, have had a die-cast/pot metal gearbox or would it have had the cast-iron gear box like that of the Staghorn? I'd like to find the right gearbox - though that may be wishful thinking. Thanks for taking time to research this fan for me! I share the research with everyone when I post. Or, those who give a hoot about the research. There is a Menominee article in electrical trade support the 8" model types 155 and 129 in 1919 sharing the market. The 1918 Menominee article does NOT SUPPORT any new models from Menominee placed on the market. New models where placed on the market in 1917. Logic dictates the 8" model types 155 & 129 shared the market starting in 1917. In 1919 it is clearly stated in electrical trade the 8" oscillating model types 155 & 129 now used pot metal(die cast alloy) for the motor housing and gearbox. 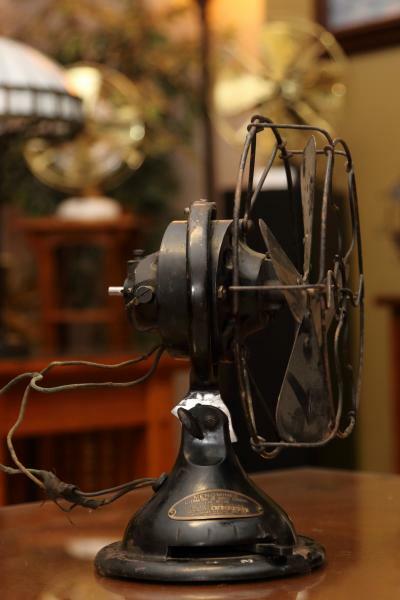 The ebay fan you posted dates no earlier or later than 1919. 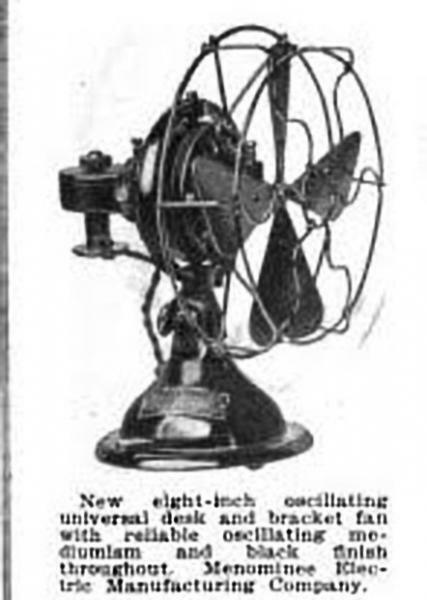 By 1920 Menominee fans were now manufactured under new design in Cairo, IL. Model types 155(SG/SB) & 129 (BB/BG) manufactured 1917 & 1918 would at least have a cast iron motor housing. 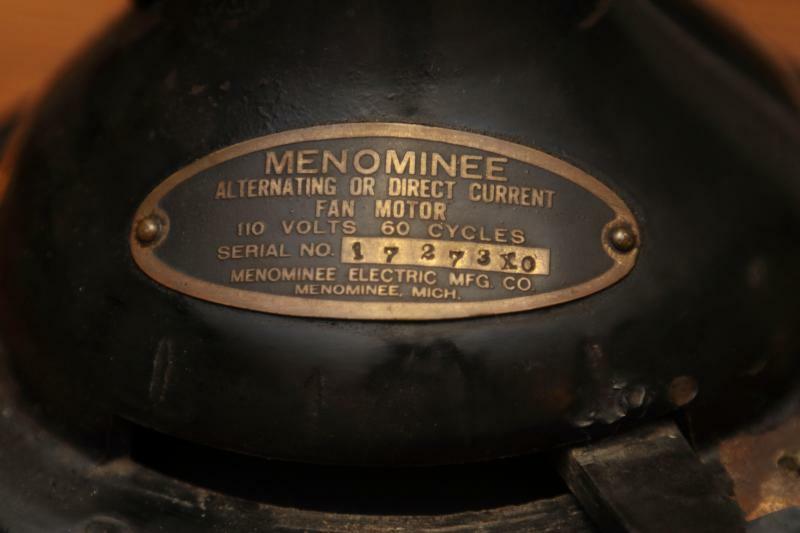 There is the possibility Menominee may have used a die cast gear box in 1918. In 1919 Menominee announces the use of DISHED OR CURVED blade wings. Only 1919 models would have these wings. As to the use of the dished blade wings on ALL models in 1919 that I don't know. I was doing some more looking around. I wasn't sure if the steel cage and blade were correct for this fan. I found a post that you made back in 2016 that confirms that steel is real. Now, if I can just find a gearbox. It is looking mighty strong Menominee was offering an option of the inexpensive 155 and the brass trimming 129 in 1917-19. Menominee it appears dumped the heavy duty guard and staghorn struts in 17 on the 8" brass & brass oscillator. Page processed in 1.2640 seconds (88% database + 12% PHP). 31 queries executed.